Tax Cascading: The most significant contributing factor to tax cascading is the partial coverage by Central and State taxes. The exempt sectors are not allowed to claim any credit for the Cenvat or the Service Tax paid on their inputs. Levy of Excise Duty on manufacturing point : The CENVAT is levied on goods manufactured or produced in India. Limiting the tax to the point of manufacturing is a severe impediment to an efficient and neutral application of tax. Taxable event at manufacturing point itself forms a narrow base. For example, valuation as per excise valuation rules of a product, whose consumer price is Rs. 100/-, is, say, Rs. 70/-. In such a case, excise duty as per the present provisions is payable only on Rs.70/-, and not on Rs.100/-. Inability of States to levy tax on services : With no powers to levy tax on incomes or the fastest growing components of consumer expenditures, the States have to rely almost exclusively on compliance improvements or rate increases for any buoyancy in their own-source revenues. Interpretational Issues: whether an activity is sale or works contract; sale or service, is not free from doubt in many cases. GST means Goods and Service Tax. It is an indirect tax levied on sale of goods and services. The reformists believe that GST is one of the most awaited law which upon introduced will boost the economic growth in the country. This law if passed by the parliament may come into force from April 2016. As everyone is talking about it now, let’s get into the basics of the proposed law in this article. Present system – This can be better explained through an example. Suppose you buy soap for Rs.50 per piece, it includes Excise Duty, VAT or CST, Customs duty on the imported raw materials, etc. So, currently you will have to pay multiple taxes on the same product. Let’s take another example; the food you buy at hotels will have VAT as well as Service Tax. Complexities in the present system – The taxes are levied by central government as well as state governments. So, the businessman has to maintain accounts which will comply with all the applicable laws. It is perceived to be a complex system. Hence, worldwide over 150 countries have adopted GST, a simple tax system. Though it is late, India is catching up with the global trends. If the GST bill is passed; will it come into effect immediately? NO. The earliest day we can see GST in India will be in April 2016. Again implementation depends upon the initiative and involvement of state governments. Some of the states may act quickly and some of them may take time to implement. GST Rate- Today, one pays Excise Duty of 12%, VAT of 14% on goods (totaling to 26%). 12% service tax on services. So, the rates may be anywhere between 12% and 26%. The average worldwide GST rate is around 18%. (a) GST is based on the principle of value added tax and either “input tax method” or “subtraction” method, with emphasis on voluntary compliance and accounts based system. (b) It is a comprehensive levy and collection on both goods and services at the same rate with benefit of input tax credit or subtraction of value of penultimate transaction value. (c) Minimum number of floor rates of tax, generally, not exceeding two rates. (d) No scope for levy of cess, re-sale tax, additional tax, special tax, turnover tax etc. (e) No scope for multiple levy of tax on goods and services, such as, sales tax, entry tax, octroi, entertainment tax, luxury tax, etc. (f) Zero rating of exports and inter State sales of goods and supply of services. (g) Taxing of capital goods and inputs whether goods or services relatable to manufacture at lower rate, so as to reduce inventory carrying cost and cost of production. (h) A common law and procedures throughout the country under a single administration. (i) GST is a destination based tax and levied at single point at the time of consumption of goods or services by the ultimate consumer. In India, the GST model will be “dual GST” having both Central and State GST component levied on the same base. All goods and services barring a few exceptions will be brought into the GST base. Importantly, there will be no distinction between goods and services for the purpose of the tax with common legislations applicable to both. For Example, if a product have levy at a base price of Rs. 100 and rate of CGST and SGST are 8% then in such case both CGST and SGST will be charged on Rs 100 i.e. CGST will be Rs 8 and SGST will be Rs.8. Interestingly, as per the recommendations of Joint Working Group (JWG) appointed by the Empowered Committee in May 2007, the GST in India may not have a dual VAT structure exactly but it will be a quadruple tax structure. 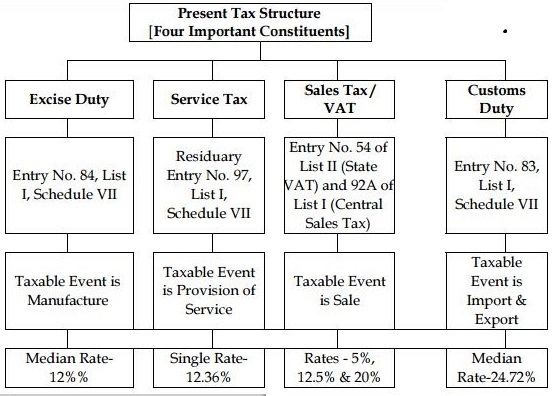 It may have four components, namely – (a) a Central tax on goods extending up to the retail level; (b) a Central service tax; (c) a State-VAT on goods; and (d) a State-VAT on services. 1. There will be Central GST to be administered by the Central Government and there will be State GST to be administered by State Governments. 2. Central GST will replace existing CENVAT and service tax and the State GST will replace State VAT. 3. Central GST may subsume following indirect taxes on supplies of goods and services: Central Excise Duties (CENVAT)· Additional excise duties including those levied under Additional Duties· of Excise (Goods of Special Importance) Act, 1957. Additional customs duties in the nature of countervailing duties, i.e.,· CVD, SAD and other domestic taxes imposed on imports to achieve a level playing field between domestic and imported goods which are currently classified as customs duties. Cesses levied by the Union viz., cess on rubber, tea, coffee etc.· Service Tax· Central Sales Tax – To be completely phased out· Surcharges levied by the Union viz., National Calamity Contingent Duty,· Education Cess, Special Additional Duties of Excise on Motor-Spirit and High Speed Diesel (HSD). 5. The proposed GST will have two components – Central GST and State GST – the rates of which will be prescribed separately keeping in view the revenue considerations, total tax burden and the acceptability of the tax. 6. Taxable event in case of goods would be ‘sale’ instead of ‘manufacture’. 7. Exports will be zero rated and will be relieved of all embedded taxes and levies at both Central and State level. 8. The JWG has also proposed a list of exempted goods, which includes items, such as, life saving drugs, fertilizers, agricultural implements, books and several food items. 9. Certain components of petroleum, liquor and tobacco are likely to be outside the GST structure. Further, State Excise on liquor may also be kept outside the GST. 10. Taxes collected by Local Bodies would not get subsumed in the proposed GST system. – Stamp Duty – It has not yet been decided whether stamp duty will be part of the GST or not. *Sources of the above information – Back Ground Material Issued by ICAI on GST. b) in above case, will the GST invoice be raised in Tamilnadu (by obtaining GST registration in Tamilnadu) , by levying IGST and will it be paid in Tamilnadu? If (b) is applicable, then does one need to obtain GST registration in each state, wherever the sale is made from Maharashtra, even if there is only transaction of inter- sale in a year in that state? One word shall answer the question. : It is “Destination Based Tax”. This means goods produced in Maharashtra and Sold in Tamilnadu shall be charged in the state of Tamilnadu. As regards registration: Although, it is not very explicit but it seems that there shall be centralized or Group registration which shall be applicable to all states. Hence, tax generated from goods/service sold to “consumer” in the state of Tamilnadu shall reflect in Tamilnadu. In case of inter state sales, the tax is tracked through the IGST / CGST registration numbers of both the buyer and the seller. Ideally there should be only one registration number for a legal entity across the country and the same should be used for the CGST and IGST, this will ensure that, the thresholds are tracked correctly all transactions are under the tax preview. The seller will pay the tax to the central government, the way CST is paid today and there is a mechanism being proposed to transfer the tax from the selling state to the buying state. This is my view based on the information i have from the secondary media. Sir, why is the tax being transferred from the selling state to the buying state? Will this not result into cascading taxation? And who has to pay the tax in the end- The seller or The consumer? Only one tax that shall cascade shall be OT – Origin Tax. You can take ITC (input tax credit) of IGST, CGST and SGST. However, more clarification is yet to come on offsetting capability of IGST, CGST and SGST on one to one, one to many or many to many. In case if any one is in to business of selling excise free goods was not able to take ITC on service tax paid. Now, Service Tax is subsumed in GST hence ITC is possible even on service purchased. So, such companies shall be benefitted. Having Dual GST, Dual rate structure is again complicating the administrative work to everyone. What is it stopping the government (Other than revenue sharing threat of states) in implementing on law pan India with one rate. Also, why should Fuel, Liquor be excluded from this. Even the revenue sharing can be addressed with a SLA being agreed between Central & State based on putting a rational basis in sharing the revenue. It is definitely multi point tax but it is not cascading. Hence, 15% tax will not become 45% if it change hands from Company to Distributor to Retailer. Because, at each stage each channel member can take Input Tax Credit. He shall be entitled for ITC on SGST @ Rs 375 (5175-4800) and CGST @ Rs. 375 (5175-4800). In case of interstate sale or stock transfer, it shall follow IGST way. In this case also, IGST is fully entitled for Input Tax Credit. We are excise registered dealer. We need to pass on the excise duty to our customers. Its bit difficult to maintain these records . Even to generate bill is bit tricky. For CGST the system will be the same or we can take input tax credit as VAT in Maharashtra. Excise will cease to exist and all taxes shall be subsumed in IGST, GST (CGST + SGST) and OT. 1. All output CGST shall first be adjusted by input CGST and input IGST in that sequence within that respective state. 2. All output SGST shall first be adjusted by input SGST and input IGST in that sequence within that respective state. 3. All output IGST shall fist be adjusted by input IGST, input CGST and input SGST in that sequence within that respective state. suppose i am a trader in gujarat and i buy tea worth rs 100000 (one lakh) from west bengal, and rate of GST is 20 %. Then this 20 % tax will be collected at which stages. will it be 10 % CGST to be collected in west bangal and other 10 % on sales in Gujarat??? who has to pay tax to the government. whether the Seller or Buyer. Tamilnadu supplier made supplies to Maharastra charging tax. If Tamilnadu supplier supplies to Maharashtra customer and charging tax, he will charge IGST. This IGST shall be paid by Tamilnadu Supplier when he files his ST returns. If Tamilnadu buyer has charge IGST and if he dont pay the IGST ? What about the buyers situation ? How come it is possible to claim tax input credit ? HOW WILL BE GST IMPLEMENTED IN UNION TERITORY. On top-right of the site , there is google translating tool to select page into a regional language including Hindi. Hope it helps. We manufacture packing material for pharma units in Himachal and all my customers are based in Himachal only. These pharma units on the other hand, supply all their goods outside the state. Will these pharma units be able claim 100% motvat on goods purchased from us ? I think its Complicated… It will take time to fully implement this. The GST can be implemented only through a Constitutional Amendment Bill, which means it needs to be approved by not less than two-thirds of the members present and voting in each House of Parliament. can you inform me what is the net rate government is targeting at? I am a manufacturer . My sale price is Rs 150/ . I collect totally Rs 174/ (150+24=174) from the buyer. I pay Rs 8 as GST (24-16=8). Therefore, net tax rate for me is 5.33% i.e. Rs 8 on a sale of Rs 150. My query is “what is this rate (net tax rate) the government is having in its mind? can anyone enlighten and guide mo on this? There is nothing like “My” net tax rate or “Your” net tax rate. If I consider the above example as it is, the government is eying at 16% of VAT rate. So, if I change your example at 100 Rs purchase rate and 200 Rs sale rate, “your” net tax shall work out to 8% (16/200). But this is not relevant. It is simple value addition and the “My” tax rate is only tax on value addition. From where we can get copy of Rules & Regulations & Act as designed upto date…..? HOW WILL THE COMMERCIAL TAX DEPARTMENT OF THE STATE GOVERMENTS BE EFFECTED? WILL THEIR SIGNIFICANCE COME DOWN? IT LOOKS LIKE THE CGST AND SGST WILL FUNCTION IN SIMILAR WAY? SO WILL THE SALARY OF THE OFFICERS OF BOTH BE MADE COMPARABLE IF THEY CARRY SAME DESIGNATION IN THE CGST AND SGST RESPECTIVELY? PLEASE DO REPLY AS I AM A COMPETETIVE EXAM ASPIRANT AND LOOKING FORWARD TO A JOB IN COMMERCIAL TAX DEPARTMENT? OR SHOULD I OPT FOR CENTRAL EXCISE DEPARTMENT? Tax classification is still on the brim of the glass. The outcome can not be foreseen with the view of how the tax departments holds it hierarchy. The future beholds in the hands of the center and state equally, for the only reason that GST is going to grow along with India’s growth story. Please reevaluate your preferences and decide accordingly. But, if OT is there, it shall play spoilsport. It shall act as cascading component. Will room tariffs on a hotel in a c class city will be similar to those where business is big and exemption limit will be controlled by which method? There should be no classification of tax by city. Big or small, they shall be taxed equally depending on the tariff. Please use search option to find industry specific news. Thanks for visiting the site ! 1. can GST be also non-deductible i.e. no credit? If yes, then in what cases? 2. in the current environment, when goods leave the factory, an excise invoice is created. in GST environment what kind of document would be created? 3. as a receiver of goods from vendor, at present I book excise invoice at the time of goods receipt. what will happen under GST? The below views are personal. 1. If gst comes on “no-set off” basis then the entire purpose of bringing gst will be defeated. But I am sure there will be intermediate ways to give small dealers a composition scheme as an option. 2. I am not an expert in excise, but government is trying to build a seamless platform for invoicing, which will be tracked thoroughly by the government. Eg: SAP is also there for building GST’s platform in India. 3. Managing of invoices will be more or less similar to VAT/CST structure as it seems more friendlier. Can I sell my goods to unregistered dealer from one state to another state? To avail full benifit under GST, you have to keep your purchases from Registered dealers only, selling to URD will not be a problem. I am am a manufacturer of t shirts in Tamilnadu & I sell my products to schools in other states, who are not registered dealers, under GST how do I sell to unregistered dealer, if I want to sell to other states who are not registered dealers, do it need to register in every state ? In GST regime, there shall be PAN India Registration. As far as selling to URD is concerned, you just have to collect the tax from them and pay to government. URD(UnRegistered Dealers) shall be taken care by the government. 1. Can I take State Registration or keeping the old registration and doing the same what I am doing ? 2. If I taking the State Registration If I am collecting service tax from Other States what should I do ? How does a GST affect Apartment Complex. if maintenance charges is above 5000 service tax is applicable. is there any ruling to this effect or will it out of GST. if it there how does GST work in this case. 1. Imports – Incase of Imports how GST will be charged. Currently when we import, we cannot offer the duty against Sales tax (like we do in normal purchases). So after implementation of GST what will be the scenario ? 2. VAT – Currently VAT on some products is 1%, 5% and 12.5%. So does it mean after GST is implemented, sellers paying VAT 1% or 5% or 12.5% will have to pay 18-20% GST ? What will be the effect to seller paying only 1% or 5% VAT or Sales Tax as per present system? Thanks for your guidance in advance. 1. The basic criteria for bringing GST is to seamlessly make Input tax credit (ITC) available, including import duty. It should bring in a big advantage for importers when the actual GST law is made available. Also am sure many other tax experts visiting this site should feel free to comment on your concern. 2. Initially it seems the commodities which are charged at lower VAT rates will be charged at applicable GST rates, may be quiet higher than 1 or 5 %. But they shall also be eligible for any set-off (ITC) on purchases made across PAN-India, including the higher GST rates. So net-net the GST effect will start becoming fruit full in couple of years after implementation. There are few downloadable documents available in the DOWNLOAD section, which shall help you to understand better. Its a learning Phase for all of us. What is the point of taxation for goods? What is the point of taxation for services? Meaning, they say that the time of supply rules apply. So shall i understand that either the removal, or the payment, or the invoicing or the supply, whatever happens first, that moment the tax is supposed to be paid? If that is the case, in case of payment, what is the base document for recording the transaction? Invoice is not available! Can someone please share the concept of GST related to this preferably with example. The below site search link will help you. Please take some time out to learn about the same. Hope this site provides enough material to gain answer to the question you are looking for. Good luck !! How GST will impact in our type of production and export activities. We import raw material by paying customs duty 7.5% and customs duty cess 3%. In GST, will this continue? If so, can we take input credit on this? GST has technically covered a lot of ground in past two years. Once approved by Rajyasabha of Indian parliament, GST can be implemented very soon. Probable date can be in 1st April 2017. There is a tab in the menu to translate the site in regional language, including Hindi. Hope it helps. Thanks for your visit. I am importing toys from China ..who ll I ne taxed..import duty customs gst..should I pay all..
How ll I be taxed as an importer from China. There is a feature on top menu of the site “site language”. One can select regional languages including Telugu. Hope it helps and thanks for visiting. plz can any one tell me the drawbacks of gst i need help in debate i am against the motion it will be a great favour. What will be the process for Supplier Returns / Customer Return ? How GSTR1 or any other document changes because of return. How advance payment will be handled in GST ? How GST will impact sub-contracting? Impact of GST on inbound and outbound warehouses ? Hi . There is a good chance that there can be an escalation on cost initially, specially in unorganised category. But it all depends on probable understanding of the law. Will have to wait and watch for this one. What about existing Invoice/bills.. Will GST be applicable on them too..
Mostly looking at the Invoice which are charged for the entire year (membership charges for gym). how will GST impact those bills. If they have been created but not paid.. Or also if created and paid, but as the service is being rendered throughout the year will GST be applied. and I dont have VAT No. and CST Shall I take Vat or wait for GST. we have Two manufacturing unit in same district, than sale invoice seriers seperately or combined. I believe the concept of consignment is not allowed under GST, but what does ‘consignment’, in this sense mean? For example, an art dealer works on consignment. I.e. they take the painting/sculptures from the artist, and only raise an invoice when they have sold the piece. How does an art gallery/dealer now work? Must they buy all the paintings and pay taxes, before they can ensure a sale? No article I have read has given me any clarity on this concept. If you could please give us some guidance. We’ve a few products which in pre-GST era were liable for ‘State Excise duty’ due to alcoholic content. In the absence of LUT/Bond, we had exported these products by charging off State excise duty and used to claim this paid state excise duty as rebate (not refund – as refund was not allowed). This rebate is like our current account balance against which state excise duty payable on local sales used to get adjusted. As at 30.6.2017, we’ve huge balance of this rebate around Rs.14 lakhs. So, how should this be treated in GST era?